Over the past few years, the company's identity has slowly shifted from its member breweries to this weird, amorphous entity called "CBA." It leads to sentences like this later in the article: "CBA has also shifted its focus toward smaller brewery taprooms ... and [is] expanding innovation brewing efforts in Portland." In the strict sense, this is accurate. But in another, more accurate sense, it's highly misleading. There is no CBA brewery in Woodinville or Portland or Kailua-Kona, Hawaii. Chris Furnari is talking about Widmer Brothers. I speak to a lot of people interested in beer, including many who don't live in Portland--and they read the news about CBA. When I hear from these folks, they're much more likely to mention CBA rather than the member breweries, as if that corporate entity is more tangible than the brick-and-mortar buildings that constitute its holdings. I'm near the end of my current project, a book-length biography of Kurt and Rob (paid for by the brewery!) and this recently came up in my narrative. It's true that at this point, the Widmer Brothers brand is not the driver of sales for the parent company. 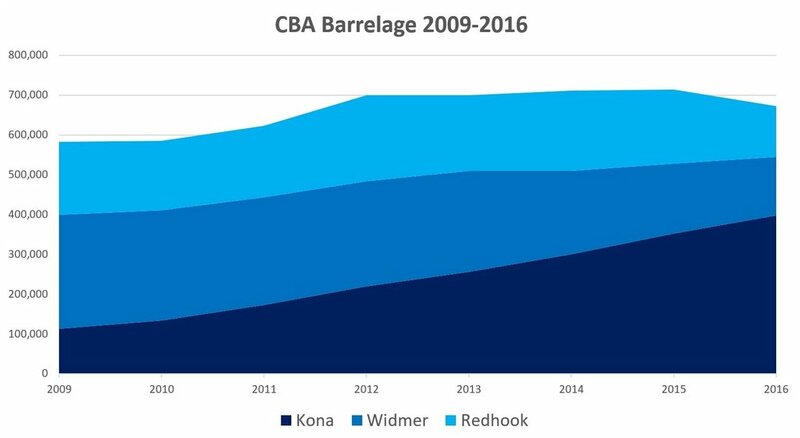 In fact, the proportion that Widmer and Kona constitute of CBA's sales have just about inverted over the past seven years. If you look at CBA's balance sheet, this is a highly relevant fact. However, if you live in the city of Portland, Kona's presence is small, and CBA's is of course non-existent. There isn’t any CBA beer. Within Portland—where craft beer is consumed in greater quantity than any American city—Widmer is still the anchor craft brewery. When you visit the old brick Smithson and McKay building, the sign outside says “Widmer.” When you order a beer, the options are all house-brewed Widmer Brothers ales and lagers. If you go to a Blazers or Timbers game, the local beer sponsor is Widmer Brothers. Each autumn, Widmer Brothers hosts a local Oktoberfest. In Portland, where we inhabit the terrestrial, three-dimensional world, Widmer is large, present, and basically unchanged since it started inhabiting that building more than 25 years ago. This is a small but possibly important note. People who follow beer closely are paying ever more attention to the business side of things; which company bought which brewery, which legacy brewery is down 6% in a quarter. But that gives us only one narrow data point. It's not wrong. But it may not be exactly right, either. If Boston Beer is in "freefall" this year, real human beings will nevertheless still drink on the order of 580 million bottles of their beer. And in Portland, Oregon, you won't find much Redhook or Kona beer, and you won't be able to visit the CBA brewery. But you will be able to find plenty of Widmer Brothers. Reality is complex, and meatspace shouldn't be forgotten.